Today was my first day at Japan Women’s University (JWU). The summer intensive language program will be taking place there starting Friday. Today, however, I have to take the placement test to determine what level of Japanese class I need to take. In Japanese, JWU is 日本女子大学, nihon joshi daigaku. Most Japanese people shorten to to 女子大学 (joshi daigaku) or even just 女子 (joshi). The first part of the test was about an hour, one part kanji reading and writing and one part grammar. Both were slightly frustrating as I forgot some of the kanji I should have known and I didn’t have enough time to finish the whole grammar section. The second part of the test was much longer and consisted of a pile of kanji that I had never seen before and a pile of multiple choice grammar questions that I couldn’t even read, much less understand enough to pick a correct answer. I understood maybe three questions out of the whole grammar part of that test. It was really annoying. But I wasn’t the only one; only the really advanced students figured out some of what was on there. 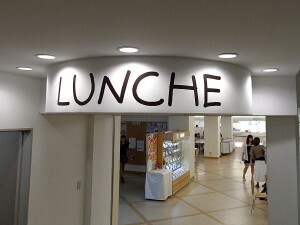 After the tests, we went to the cafeteria to have lunch. And we discovered an absolutely classic example of Engrish on the way there. Perhaps they’re trying to imply that their food has a French flair to it? Or maybe they’re trying to duplicate the McDonald’s McCafe commercials. I dunno. Everyone took the obligatory snapshot and then we got our grub. Japanese cafeteria food is actually quite good compared with most of the food I have had at UCSD. Though maybe it’s just because I’m bored with all the food at UCSD and haven’t had a chance to get bored with Japanese food. Hard to say at this point. At any rate, the food was excellent. Though I did made the mistake of getting hot tea instead of cold tea so I had to wait quite a while before I could take a sip. Oh, well; live and learn. The A class is the least advanced, actually. And I didn’t have a problem with my engineering classes, the problem was that I was spending more time studying for 1 Japanese class than 3 electrical engineering classes.